Universal VAT Services is recognized as the world's leading VAT reclaim provider. Universal VAT Services (UVS), established in 1993, is an Atlanta, Georgia, based US President’s ‘E’ - Award winning, certified Minority Company. Our sole area of operation is the refund of Value Added Tax (VAT) and related services. The company has a global network of indirect tax experts and Team UVS delivers to one of the highest service levels in the Industry. This proactive boutique company specializes in recovering VAT from several VAT refunding countries, for corporate clients on a Contingency Fee basis. In other words, “No recovery, no fee charged”. UVS takes the hassle out of untangling complex VAT laws. All that clients need to do is hand over their original hotel and other VAT invoices to us. We take care of the rest. . The UVS back-office operations is based in a secure environment in Mumbai, India. Our experienced and capable staff are selected on the basis of superior mathematical skills and ability to work on various technical platforms, these parameters allowing for greater speed and accuracy in handling VAT recovery processes. To provide maximum VAT recovery and compliance services within the scope of laws, with complete transparency and efficiency. Integrity - As a financial services provider, we place integrity at the top of our list of values: honesty and adherence to the law are fundamental to all our interactions. Professionalism - To provide the highest level of tax recovery services, and leave no stone unturned in providing a quality VAT refund service. Knowledge - In a world that is constantly changing, we continuously work on and update our existing, deep understanding of the various VAT refund laws. Knowledge, we believe, is key to successful VAT recovery. Transparency - To maintain complete clarity in all our dealings with clients: with UVS, what you see is what you get. Reliability - To efficiently deliver on every commitment we make. You can rely on UVS, as much as you can on the sun to rise tomorrow. Confidentiality - UVS is alert to the fact that client documents are sensitive in nature. Documents placed in our trust are handled with the highest level of confidentiality in all our operation..
Security of client data is of paramount importance to UVS. Every care is taken to ensure our data and computer systems are compliant with the highest standards of safety. Do contact us for our detailed Data Security Policy if required. UVS is keenly aware of global initiatives on sustainability and encourages all its employees to act in a responsible manner when it comes to the environment, safety, human rights, climate change, and the community at large. UVS is a certified Minority Company. The Company’s North American Industry Classification System (NAICS) Code is 541219. 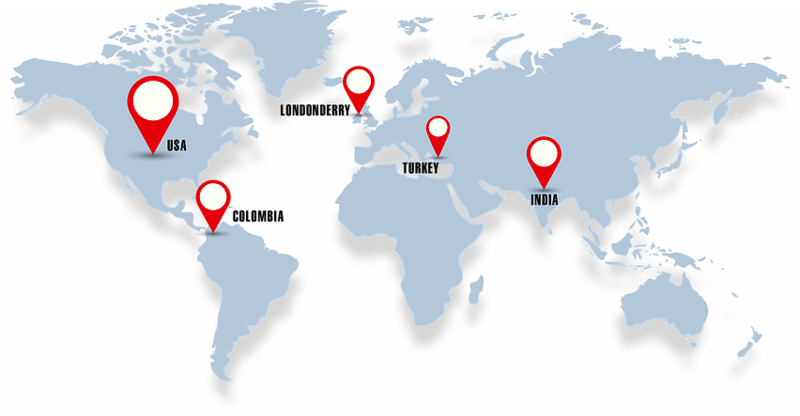 UVS has an expanding global network. The map below illustrates the current network. Successful companies understand the winning principles of teamwork. UVS has a global team of technical experts who ensure UVS VAT refund claims are settled promptly. Our success rate since inception, consistent at over 95%, is largely due to this cohesive functioning across the globe. Here below is our Technical Team.